Give a guy a gun, he thinks he’s Superman. Give him two and he thinks he’s God. — John Woo’s HARD BOILED. 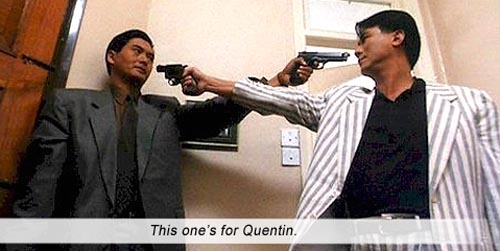 Some call John Woo‘s THE KILLER the pinnacle of balletic, bulletic, action art. Well, it’s a pinnacle all right – of something. Not really a ballet, unless you count the hundreds of slow motion shootings and different ways of dying by falling through windows and onto car roofs and diving onto tables; you won’t see this many bullets onscreen at one time unless you’re watching a documentary about a bullet factory; and you probably won’t see this many bad actor stuntmen until the next straight-to-video Steven Seagal movie. It’s epic trash, but Woo writes and directs with a killer hand. But Jong’s employers renege on his last payment, instead putting out a hit on him. Where have we heard that before? Everywhere. No matter, as Woo carves his own inimitable heiroglyphs into the genre: once more, iconic action figures do their Peckinpah dance, all pulp and circumstance. They’re not real people, they’re tropes fulfilling story elements in Woo’s tribute to “honor and friendship.” Most of it is shallow entertainment clothed in well-worn themes and shot at us as kinetic art – and if no one comes along for the ride, Woo doesn’t care. It’s taking off without them. Jong remarks on examining a gun, “Easy to pick up. Hard to put down.” Kinda like John Woo’s staged shootouts: maddening unstoppable frenzies. But it must be said that Woo and his choreographers have a talent for keeping track of the action – you never wonder what point of view you’re viewing or what’s happening to who; it’s over the top and unnecessary, but it’s all tracked very decisively. Inspector Li (Danny Lee) comes after Jong with a vengeance and ends up realizing Jong is honorable and charming and smooth in all the right places, so teams with Jong for a final battle against a common enemy – the Triad. Amidst all the funny stuntmen dying, Woo interweaves a tragic story and operatic climax. If you can see past the bullets. aka: DIP HUET SEUNG HUNG. aka: BLOODSHED OF TWO HEROES. Starring: Chow Yun Fat, Danny Lee, Sally Yeh, Kong Chu, Kenneth Tsang, Fui-On Shing. • Chow’s hitman “Jong” becomes “Jeff” in some English translations. Killer Jeffrey. • Inspector Li has a hardon for Jong – literally. He describes him to a sketch artist with a faraway look in his eye: “He looks determined, without being ruthless. There’s something heroic about him. He doesn’t look like a killer. He comes across so calm. Acts like he has a dream. Eyes full of passion.” Thankfully, the camera cuts away before he spurts. • In the famous standoff scene where Jong and Li hold guns on each other, their nicknames in the most famous translations are Dumbo and Mickey Mouse. Apparently, correct Cantonese translation is Runt and Shrimp Head; other translations, Small B. and Numbnuts.